In the mood for something sweet? Well we’ve got a special treat for you! 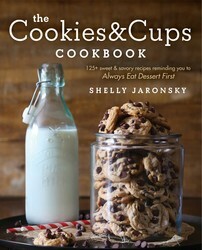 In honor of baking blogger Shelly Jaronsky’s THE COOKIES & CUPS COOKBOOK coming out on April 4th, we want to give you a chance to win some of Shelly’s special swag and a signed copy of her highly-anticipated cookbook! Shout-out to Bakerella for this awesome picture! To enter for your chance to win Shelly’s “SQUAD” t-shirt and a signed cookbook, comment below with your favorite baking memory! Did you learn how to make Apple Pie with your grandma or teach your kids how to frost a cupcake? Tell us about it and you might win! Sweepstakes ends April 13th. For official rules and terms & conditions, click here. Sweet tooth still buggin’ ya? Here is Shelly’s recipe for the best chocolate chip cookies ever* (*our opinion, but it’s right) plus a step-by-step video of Shelly showing you have to make these scrumptious treats herself! Get out your cookie scoop- it’s time to get baking! Still want more Shelly? Enter her COOKIES & CUPS COOKBOOK pre-order sweepstakes on her blog right now for your chance to win a hot pink Kitchen Aid mixer and so much more! Hurry- contest ends soon! How wonderful. I remember my grandmother teaching me to roll out the Pa Dutch Pot Pie dough. She taught me lots of great things and let me help her cook all the time. My favorite baking memory is making gingerbread cookies with my nieces and nephews and seeing their excitement at their creations! I didn’t learn to bake until I was older. The first time I tried to bake a cheesecake for a friend, he did not tell me he couldn’t eat it because it was so bad until a few days later. My favorite baking moment was when me and my friend, Gina, had to bake a homemade loaf of bread for home Ec class in 11th grade(that was about 20 years ago!). After waiting for the loaf to rise and taking the time to bake it we ended up burning it and had to start over! We were up until about 3 AM! We had a blast doing it though! Nothing made me happier as a child or filled me with love than baking in the kitchen with my grandma & mom!!! There’s just something special that happens when you’re creating yummy goodies like cookies, cakes, brownies,& rice crispy treats etc with your loved ones!!! Now it makes my heart happy with memories to bake with my kids & pass down knowledge that has been learned by those before us!!! Thanks so much for the opportunity to win & good luck to all those who enter!!!???? I remember in grade two my mom having a bunch of kids over to make cookies. Not sure if I learned a lot then, but had messy fun. Instilled a love of baking. On of my very first memories of baking was when I was about 10 or 11 and I found the Oatmeal Cookie recipe on the Quaker Oats box. I would make them at maybe once a week and they were ALWAYS too salty. My mom got out what I need to use and then let me do the ingredients by myself and then would help with the mixing and oven part. After the third or fourth time mom decided she needed to watch me carefully to see what exactly I was doing wrong. Turns out I was using the tablespoon instead of the teaspoon. Oops! I can’t look at an Oatmeal cookie with out giggling at the memory. One of my favorite Christmas traditions has always been baking with my mom or sister. We’d make some cookies the same every year plus we would add some new recipes so you never knew what you were going to get. baking biscuits with my mom on sunday morning. She would make them from scratch or as close as you can get to scratch. My favorite memory is baking with my nephew when he was 5. He loved to operate my mixer when I was making pound cake from my grandma’s recipe. I made chocolate chip cookies at age 12 by myself. Ended up with 8 giant, hard as a rock cookies. My dad broke them up in a glass of milk and ate with a spoon….he ate every one of them! I will always remember the time I went picking blackberries at camp in the summer and my grandmother and I were both nightowls and she made a blackberry pie from scratch at 2:30 AM with my berries and we ate a piece when it came out of the oven! She was always so cool!! Here’s my favorite cooking memory! French has been my second language my whole life. I read Marcel Proust’s Remembrance of Things Past for a class and fell in love with Madeleines, a French sponge cookie in the shape of seashells with lemon zest. An opportunity came up to make them when we had an International Day potluck on campus. The French foreign exchange student was having a heck of a time in the kitchen with getting the right consistency. When she saw me, she begged me to help – I had never made them before, but in the spirit of international cooperation, I decided to give it a whirl. I got it right on the first try! I’m proud to say that in this case, I was able to save the day by baking a French pastry at the request of a native Frenchwoman! P.S. That shirt is adorable and I would love love love to get a signed copy of this book! Favorite baking memory has to be the holidays whether it’s Thanksgiving or Christmas it’s always fun when every family member is in the kitchen contributing to the meal. My favorite baking memories do involve my grandma. The one I remember most is help make tarts, which for this version were round cut-outs of pie crust, bake and then top with jelly…grape. So tasty. Making chocolate chip cookies with mom. Standing on chair or stool at the counter. Waiting till just the right time to get some yummy cookie dough (forget the cookies). My favorite baking memory was trying to learn to make apple strudel from scratch with my mother. She went to an old Eastern European woman to learn how. I am still trying to perfect the home made phyllo dough. But even the not perfect ones taste good. I remember working in the kitchen with my grandmother in Boulder. Colorado. She taught me to make her light and tender homemade dinner rolls that he sons sold door to door during the Depression to help make the ends meet. She was a wonderful cook! My favorite memory is teach my kids how to hold the piping bag to pipe macarons. It was a mess with the batter coming out both ends but we had lots of fun. My favorite baking memories are of Christmas baking with my mom. She’s gone now but it still seems like she’s with me when I bake at Christmas. My mom taught me how to make homemade cinnamon rolls. The times I spent baking with my mom were the greatest. Now that she’s gone, I have those memories to remember fondly and smile. Funny you should ask. My favorite and my first memory is baking cookies with my grandmother. We started out with chocolate chip and ended up making Peanut Butter, Sugar, and White chocolate macadamia. That wonderful southern lady was the BEST cook ever!! Cherished memories of making Christmas cookies, kruschiki and coloring eggs with my mom and grandmother. They taught me tips long ago that I still use today. I’ve always been a baker and I love that I now have a little girl, who is 5, to bake with! My favorite memory of baking is with her and it was a day we made cupcakes, for no reason . I separated vanilla frosting into 4 different bowls and we mixed food coloring to make new colors. I also brought out a dozen different toppings for her to decorate with. We had such an amazing afternoon making all different cupcakes and even got it all over ourselves and all we did was smile and laugh all day. I hope it’s a memory she’ll always treasure as well. My grandmother taught me how to bake tea cakes and pound cakes.She was a wonderful cook and I still use a lot of her recipes. My mother wasn’ t much of a baker, but she did bake amazing things for the holidays. I remember every Easter and Christmas baking with her. Especially Easter, she would be making the dough for the pies while I stirred rice for the ricotta pies, and chopped meats for the Pizza Rustica. Now my (adult) sons also have spent holiday’s stirring rice and chopping meat for those special treats! I remember making French cookies with my grandma growing up every Christmas . Now that she is no longer living I am the one to make the French cookies . My first baking memories are of using my Easy-Bake oven and Sesame Street measuring cups. My baking memory is with my sister Becky, when we ~10, baking oatmeal cookies from scratch. No, we didn’t really know what we were doing but we certainly tried. One of my fondest baking memories is making a chocolate ice box cake with my mother for my birthday. Nothing gourmet at all-a store bought sponge cake frosted with Hershey syrup mixed with a little vanilla and heavy cream. Happy times! Every year at Christmas time, my youngest daughter and I bake tons of cookies. She started at three and this year she will be twelve. She gets so excited to bake our cookies it the first thing she asks about not presents or anything else. When are we making our cookies? I remember every December holiday we would bake all kinds of cookies as a family, and everyone had their part – the oldest would watch the cookies in the oven until exactly the right golden brown colour, the youngest would eat more dough than actually baking. It was the best time of my life! When my son was little we would go to a friend’s house and my friend and I would bake sugar cookies and the kids would decorate them. That was a lot of fun. I would be honored to win this!!! My spouse calls me Cupcake so I would love that shirt! Earliest memory of baking has me in my mother’s NYC kitchen, making a batch of PB cookies, carefully cross-hatched by fork, of course. I don’t have any baking memories from my childhood. So I try to bake with my boys as much as possible. My favorite memory of baking with them is from 2015 Christmas baking. We were at the table decorating cookies and my oldest (8) was encouraging my youngest (3) . Every time he put sprinkles on his brother would tell him how great it looked and cheer. The youngest got overexcited and dumped about half an inch of sprinkles on one cookie. We laughed so hard and his brother HAD to eat that one. My Gram was a great cook. My Mom doesn’t like to cook, so she usually does the bag of salad mix course for any family dinner…I saw a need for a baker early on, so I got into baking early. I’ve always liked science and the way chemicals – and ingredients – react when combined, cooled or heated. Baking was my niche because of the creativity AND the constancy of it. Some baking is forgivingly creative, yet other items like certain crusts and shortbreads require a stern structure and are compketely unforgiving. The duality of baking is exquisite! Making Christmas cutouts every year with my daughters and sometimes my niece. We had a blast and always ended up eating way too many of them. This sounds wonderful..my favorite cookie is the chocolate chip cookie. Believe it or not, when I was in high school, our cafeteria had some of the most amazing chocolate chip cookies. I know right? One of the ladies made them special herself and they were wonderful! I remember making no bake cookies in home economics class in school. They were really tasty. My favorite memory is making Christmas cookies with all my family every year! My mom wasn’t a baker so it was fun for me when birthdays came around because we got to make a cake from a box mix. Lol! Looks like a great book! My favorite baking memory is making sugar cookies every Christmas for my dad. It’s definitely a labor of love and I love to see the look on his face every year as he enjoys every bite! Thanks for the giveaway! My Favorite Baking memory is twofold actually. My wonderful Godmother was and is the most profoundly Good baker I have ever known. Having her recipes in my heart and recipe box mean more to me than almost any I have. However, I think even more than the wonderful years I spent at her side, learning to measure, sift, taste and perfect her creations has been the wonderful memories I created and traditions that I was able to pass on to my daughter Dawn. Add to that the times I spent making cookies and decorating them with my Grandson John. We lost this precious soul when he was just 4 years old to a devastating incurable brain tumor called DIPG which robs families of their young children! We are still struggling to overcome his death this past August. Baking with him and the memory of those times fills my heart. This past weekend Dawn and I continued that tradition with his little sister Charlotte…now 3 as we baked and decorated some wonderful sugar cookies (from this site actually) for Easter. I remember when I was 5 years old and our neighbor asked if my friend and I would like to go over to make Peanut Butter Cookies. We spent the day making cookies, eating and having fun. It is a memory that I hold dear to my heart especially now that I’ve lost touch with that neighbor. Cooking with mom was making pies and cobblers and canning. Cookies I learned on my own. After that they were the only things I was allowed to bring to get togethers. Forgot the cookies one Christmas and the mother-in-law never let me forget it. She had no dessert prepared. My grandmother from Poland used to make cookies that were kind of simple, cinnamon cookies. We named them Grandma Cookies since there weren’t any others like them. When I asked her for the recipe (I was quite young), she showed me what she did. But she didn’t use a measuring cup. She always used the same glass to measure out the ingredients. So even if I remembered what she did, I would never be able to reproduce them without the glass! Says to share a memory ….well the first apple pie I made called my sister for recipe and she gave me two or three different recipes mixed up together.lol Needless to say the dogs wouldn’t even eat it. But I can make them now. I remember spending weekend with my aunt and making chocolate chip cookies. Of course we probably ate more dough than cookies. One Grandmother taught me to make raisin bread; and, I still have two of the bowls we used back then to place the dough into while letting it rise! I loved the taste of the bread and the magic of baking it. My other grandmother taught me to makes the best cinnamon rolls ever! I loved to eat the raw rolls before they were baked ! 🙂 And, the smell of them cooking was (and still is) heavenly! I’m such a fan! I’ve been following Shelley on Pinterest for years! My first baking memory is helping my father make chocolate chip cookies. It was my job to add the chips & the walnuts. I thought it was the coolest thing to lick the beaters. Happy memories! My favorite all time cookies are my Grandmother Dada’s molasses cookies. No one in the family can make them like she did. We all think there is a secret ingredients that we are missing. Baking with my grandma are some of my favorite cooking memories. She taught me the joys of raw cookie eough. My Gram baked every day and she always let me help. Licking the spoon and cleaning the bowl was a special treat that my brother and I would fight over :). When I was in high school I frequently baked brownies, My younger brother particularly loved them. One time I made them, baked them, took them out of the oven and wondered why they had not risen as they should. I said to my brother I thought there was something wrong with them and I needed to ask mom but she was out. I put them aside to cool and went and did something else. My brother sneaked the entire pan into his room where he devoured them. He was spectacularly sick and my mother said it served him right because had he waited for her to get home when she would have told me I had forgotten either the baking soda or the baking powder. That is my favorite memory because my brother used to steal my comic books before I had read them so I felt like I had revenge. Also because I learned from this why my Home Ec teacher taught us to set out all the ingredients before we started and to oput them away as we used them so that if at the end there was an ingredient still sitting there, we would know we had forgotten it. This has been a very valuable tool for every baking project. I loved to bake with my mom, especially at Christmas time! My memory is the first time I tried to make a gingerbread house from a kit. I had no experience and ended up making the icing too thin. It looked like an abstract house. I’ll always remember my parents making Easter Grain pies every year since I’ve been born(I’m 47). I loved making Italian cookies with my mom and nana during the holidays. There were special Italian cookies that we made that had a flavor and texture that were divine. We called them “beehive” cookies because of the shape. I still think of my nana every year when we make them. My grandmother passed away when I was very young but I will always remember getting together with all of my sisters and helping grind walnuts for the special bear’s paw cookies she baked every Christmas. They were so hot coming out of the metal molds I helped to stuff with the filling that they steamed as they were rolled in their coating of cinnamon and sugar. I always look for candles that have a cinnamon fragrance because it takes me back to baking with my grandma. Thank you for the chance to win this lovely prize package. My best baking memory would have to be watching my grandma bake bread, buns, caramel rolls and long johns. She never used a recipe and couldn’t tell me how much of anything she added to it because she said she just “did it”; there was no recipe. Man I miss her! My favorite baking memories is making cookies with my boys or making them birthday cakes. They always liked to eat the extra buttercream icing and made a mess! Now that they are older and moved out I would love to have that mess again. I remember baking with my Grandmother. She made spritz cookies that would melt in your mouth. My favorite baking moment is when my Mom was showing me how to make cinnamon rolls. We had placed the cinnamon rolls out in the sunroom to rise, but soon forgot about them. When we finally remembered, the rolls were overflowing and looked like they had ate the table. We laughed so hard at the site. My favorite baking memories are the baking disasters because they made us laugh so much we would have tears streaming down our faces! My mom’s Swedish Meatballs made with cookie crumbs rather than bread crumbs tasted just terrible but my dad happily ate them because he thought my mom wanted them to taste that way. My cherry pie made with cherries with the pits still in them that wasn’t discovered until someone bit into one. And my grandma’s baking powder biscuits made with four tablespoons of soda rather than four teaspoons had the consistency of hockey pucks. Laughter is always the best treat! baking for the holidays with my mother. I remember the first time I baked, it was brownies from scratch. I was around 11, and I found the recipe in a book I borrowed. In all honesty, it wasn’t the best brownie I made…It was over baked and dry (but hey it did not burn nor did I get salmonella). This experience did open up my love for baking though. I just love the chemistry of mixing things together in a perfect recipe. It’s just fun. I taught myself how to bake. At Christmas I make over 1000 cookies for gifts. My gramma taught me to make the best peach cobbler using bisque just that thickens the juice from the peaches (you can even use canned peaches. I taught my girls who have families of heir own now. It’s become a family favorite. My favorite baking memory was when I was little and mom let me “help” bake the pies for Christmas. They turned out great. I learned how to bake with my mom and my favorite is baking cookies for Christmas every year with her, it’s still the one one thing I look forward to most at Christmas. Mt mom always made orange nut bread for Christmas morning and we’d all get involved juicing the oranges and chopping the nuts. It always tasted so much better when we all worked on the end result. I think my fav baking memory was when I made a batch of sugar cookies. I didn’t think that were all that great, but my gran loved them. She said they reminded her of the cookies her grandmother used to make. I’m grateful that I was able to share in that memory with her. I was a rather, um, “busy” child and probably a bit much for my less-than-patient grandmother to handle when my mother, sister, and I moved in with her and my grandfather for a bit after my parents divorced. I’d been helping my paternal grandmother cook since I was three or so; my maternal grandmother had to cook for many ranch hands and didn’t like having a little one watching. So, I played in the newly opened bag of flour (a 50 lb. bag of flour), reading that there was a recipe inside. THAT didn’t go over too well (even though I’d washed my hands first). Finally, my grandmother caved. She told me to prove to her I was capable of cooking and pulled the recipe out of the flour. It was for Southern Tea Cakes, and is still one of my favorite recipes. I was 7 at that time, and baked those cookies without assistance. My grandmother didn’t mind having me in the kitchen nearly as much after that, though we moved out a few short months later. My grandma showed me how to bake her super moist & delicious chocolate cake. When she died, she left me & me alone her secret recipe, & my family appointed me as the official family baker. My favorite cooking TIMES were cooking with the boys when they were preschoolers. I am not the best cook. I bake well though. I just loved the surprise they expressed when I was able to make something successfully. And of course letting them lick beaters or bowls! Baking Minecraft cupcakes with my 7yo nephew. He saw them on a YouTube video and had to make them. He learned the hard way that YouTube videos are edited for time and baking takes a lot longer than 5mins. We had fun though and the cupcakes turned out super cute. My favorite memory is of my mom baking her mothers scotch shortbread and me always eating the dough! I would always sneak back for more and more because it is delish! I’ve since gotten the recipe down and can make it myself and my husband has now become the dough sneaker lol. It s a toss-up between the annual Christmas cookie making (mess) with my Mom, or watching her best friend make apple pie from scratch. I was fascinated with how she did a lattice top. I have so many memories of baking. One is making my grandmother’s banana cake and adding chocolate chips to make everyone happy. Another is making a marble pound bundt cake every year for my son’s birthday. Then there are the chocolate chip cookies; the Reese’s pieces chocolate cookies; the oatmeal cookies that came out like lace cookies; and, oh, yes, inevitably doing something wrong with my pumpkin pies (not the crust; I have that down), or this year, the Delightful Torte that I forgot to cream the cream cheese and left it cut in pieces. No one ever complained about the outcome of my efforts, just the one year when I used Kosher salt instead of regular salt in my pumpkin pie . . . needless to say, we tossed it out. I remember at age 7, getting my first watch, and then breaking it while climbing a cherry tree to get cherries for my mother to bake a pie with. I was upset she wouldn’t make the pie but she did. I didn’t get another watch for a long time but I did get the cherry pie. My favorite baking memory is the FIRST time I used my new convection style oven – it is amazing! The breads I baked had perfect crusts and were cooked evenly throughout. I was a very happy baker!! I don’t know about favorite but the memory that gets the most laughs is when I was making a batch of cookies at about age six, desperately hoping to impress my grandmother, who had just arrived from Japan. I cracked open an egg….and the contents landed on the edge of the table right into my grandmother’s lap and her beautiful kimono. I was mortified, but she laughed it off like it was no big deal. She also ate a lot of the cookies! I remember making these pumpkin cookies with my mom when I was in high school. They looks good in the picture, and sounded good per the recipe, but once mixed up the batter looked a lot like vomit! Baked up they looked like baked vomit. They smelled bad and tasted worse! Needless to say we tossed the rest of the batter. My favorite cooking memory is with my great-grandma. Making anything and everything in her kitchen and feeling really loved. I am a lover of cookbooks. I have books that are new and some that are 50 or 60 years old. My grandmother taught me how to cook and never had a cookbook. She never measured anything but everything she cooked was terrific. I have tried and have failed to cook without instructions. But love to cook! My favorite type of cookies are ones with almond paste and nuts. Not too sweet but full of taste! I remember as a kid watching my grandmother make snickerdoodle and spritz cookies; however, I never did follow thru and learn to make these from her myself. Wish I had – they were so delicious. I learned to bake from watching and helping both my parents. At Christmas they would bake so many dozens of cookies and dad would make fudge, divinity , taffy and peanut brittle. My brothers and I were taste testers. My parents are both 80 and they cooked an amazing Easter dinner for us & mom baked and made a chocolate cake ice cream roll with hot fudge sauce and dad whipped the cream. I have amazing memories from holidays, celebrations and family reunions – This Cookbook will be on my wish list as I’m a collector and we really enjoy cookies! My favorite baking memory would be learning to make cookies with my mother and grandma. They both helped shape me into the great baker that I am today! So excited about your new cookbook can’t wait to check it out and that tee is just too cute!! ? ? Any cooking lessons I learned were from my Grandmother and mom. Although, I think it was the freedom they allowed me in the kitchen that was the true teacher. I learned a lot from trial and error, as well as cookbooks from an early age. Pies are tricky, though and I most tricks were passed down. I remember baking with my mom when I was a little girl. My favorite thing to bake was banana bread. I miss those days so much. I wish we could still bake together, but I lost my mother to breast cancer in 2012. I have two daughters and hope to make many memories with them in the kitchen. My favorite memories are of my mom teaching me to bake and then helping her make the Christmas goodies. That now continues with my mom, my daughters, and I doing the Christmas baking together. My favorite memory was when I was about 8. I used to have sleepovers at my grandparents farm on the weekends. We always baked the most beautiful biscuits for breakfast each morning. She always started at about 6 am. I grew up thinking I could conquer the world if I could learn to make biscuits as effortlessly as my grandmother made it seem. I didn’t have grandparents growing up, they all passed before I could meet them. My Mom was a bit of baker, but it was something she did by herself, no one permitted in the kitchen, in her way. I on the other hand, bake occasionally, and love when my kids want to help out. My daughters, in their 20’s now, can now bake on their own. My son, 13, will still join me in the kitchen. I love it! My favorite baking memory is sitting on the counter and decorating Christmas cookies with my mother and sisters. And wearing my fav pink bunny slippers! learning to make cinnamon roles with my grandfather, he had the best recipe, they had to proof twice and it took forever, but so worth it! My favorite baking memory is all the times my mom let me bake stuff in spite of the mess I made. My favorite baking memories involve a Christmas tradition that my best friend and I started years ago. We get together for a long weekend off cookie baking and girl talk at her house! Some of the best memories ever! I didn’t really help bake or anything when I was little…it was when I moved away for college that I learned how to do anything in the kitchen. Baking became my escape from a bad day. When I bake 4 dozen cookies after a bad day I feel better because I have something tangible to show my accomplishment and cookies make people happy! When I was 14 I knew everything, so I decided to show my great grandmother what a great baker I was by making a perfect cake. Everything went beautifully and as I took the cake out of the oven, she exclaimed “it looks perfect.” The pot holders I was using were old and worn and the cake pan was hot, heavy and burning my hands. Reacting to the heat my hands opened and my perfect cake hit the floor. Expecting total disaster I started to cry, my great grandmother and sisters on the other hand, were giggling as my cake went rolling down the hall still perfectly shaped. We tried cutting the cake and we finally were able to with a hacksaw. My grandma made the best chocolate everything! I loved helping her bake cookies and chocolate mousse! Learning how to make crepes and rosettes with my mother and grandmother. Growing up in an Italian family, my most fondest memories began in the kitchen baking pastries, cakes and cookies with my Mother, Grandmother and Great-Grandmother. The four of us would prepare a feast of baked goods for the entire family to savour. I loved listening to my Mother, Grandmother and Great-Grandmother exchange recipes and stories from the “old days”. It was at those times, as a young girl, that I personally learned from three generations of how to bake such delicacies as cannoli, zeppole, cheesecake and my family’s favorite, sugar cookies! I cherish and celebrate each of those memories every time I put on my apron and bake from a family recipe that has been handed down through generations with love. My favorite baking memory was the first year my daughter learned how to make sugar cookies and we made them together. She was around 7 years old. We decorated them using icing, frosting, colored sugar and sprinkles. It was so much fun. I loved making molasses cookies with my Grams every Christmas. I still make them every year with my kids. I love that I have passed a family tradition down to them! Making homemade cinnamon rolls with my sister when I was about 5 years old was my first and favorite cooking memory. She’d have me stand on a kitchen chair and I’d get to not only spread the cinnamon sugar but also spoon out the glaze. (All the good stuff!) She’s eleven years older than me so I think it was a pretty nice thing for a 16 year old teenager to include her little sister in the cooking process. As a little girl, my sweet Grandmother, whom I adored, would put me on a stool and we would make No Bake Cookies. We would make them so often I memorized the recipe. She has since passed away, not a day goes by that I don’t think about her and miss her dearly, she was the best Grandmother a girl could ever have. My favorite baking memory is making endless batches of cinnamon sugar cookies for every holiday with my mother. We used a recipe inherited from my Great Grandmother that was foolproof and very forgiving which meant that my mother, a terrible cook, could use it to make really good cookies every time. My best memory is baking plain vanilla cupcakes with my mum. The first time she let me had my reign with the batter and the oven, we ended up renaming them ‘cake cookies’. Yeah that’s how hard they turned out. ?? My favorite baking memory is making eclairs from scratch with my mom for my french class! I remember it taking all day (around 8 hours) . I was so surprised that i could actually make them, and that they tasted good. The best part was seeing everyone’s faces when they tried them! I cherish memories of making cookies with my mother and now I enjoy making cookies with my daughter. Hope I win…I would like to win something. My favorite memory is not about a specific item baked. I just remember helping my mother when she baked cookies and bread. My favorite baking memory is at Christmas time, my daughter and I spend the whole day making homemade runzas! My fondest baking memories are when, at a early age, I was learning about baking and cooking with my diabetic grandmother. It made me appreciate the art of baking because anyone can bake to a point but to be a baker it takes concentration, thought, searching recipes, and studying just what goes into a dish, whatever it is. I have loved baking ever since I was a child and found it so interesting. I couldn’t wait to bake with my grandmother. I would just soak it up like a sponge. I love it. My specialty is baking bread. Thank you for letting me tell my story. My favorite cooking memory was taking Home Ec in a junior high were we put salt in a recipe that called for sugar. Yuk! My earliest baking memory (and most favorite!) is making pies with my grandma. The best! Favorite… I don’t know. It depends on my mood. Seriously. How about making Christmas cookies using Grandma’s recipe at her house with Mom and Molly when we were little? Or, maybe making an Imperial gob of dinner rolls for Thanksgiving dinner at our house? The German chocolate layer cake that wasn’t a complete fail? The completely from scratch angel food cake? There are others, too. They are all me, so they are all favorites. Even the bad ones (burned pie crust, anyone), they are part of me. My favorite baking memory was the first time my twin nieces asked if they could help me make chocolate chip cookies. We were all wearing frilly aprons. We enjoyed them later with a tall glass of milk. My favorite baking memory…. I honestly couldn’t pick. I love to bake and enjoy baking with my family, especially my mom and nieces and nephews. If I had to pick it would be baking with the women who started my interest the most, my grandmother. Baking is my stress reliever and my go to on a rainy day. I feel my self most when I am hands deep in cookie dough with flour on my face. It’s my creative outlet. Not to mention there’s nothing better in life then a warm chocolate chip cookie and glass of milk. Best memories are making Deviled eggs with my daughter, and her keeping them away from her father! My favorite baking memory is around the holiday season..Thanksgiving/Christmas and me, my mom and my siblings being in the kitchen..getting in each others way..laughing and just having a good time enjoying each others company…those are some of my favorite memories guaranteed to put a smile on my face. My favorite baking memories is making Christmas cookies with my grand mom, mom and brother when I was little! My favorite memory is making no bake cookies with my mom. I also loved when she made a pie and gave me the left over scraps to make a little pie with grape jelly. My favorite baking memory is baking a lemon meringue pie with my mother. My favorite memory is letting my kids have complete kitchen rein every Christmas for baking Christmas cut out cookies. We had an Elvis cut out cookie every year. My grandmother was a wonderful homemaker, and my mother and grandfather worked full-time. My Gran taught me to cook, and some of my happiest memories are of the times we spent together in the kitchen. Gran’s health failed, and by the time I was 10 years old, I was cooking all the meals for the family and planning the grocery shopping–with coupons! I love to sit down with a cup of fresh, hot coffee and read a good cookbook. One of the greatest escapes from everyday stress ever! One of my favorite baking memories was me and my mom baking dozens upon dozens of different cookies for Christmas. Since we have a rather large family, instead of trying to buy everyone gifts, which can be not only difficult, but expensive, we would make large assorted cookie trays for each family. Half of our dining room was covered in cookie containers! Everyone enjoyed the cookies and it was a gift made with love!